Devon Energy has agreed to acquire GeoSouthern Energy's Eagle Ford assets for $6 billion in cash. 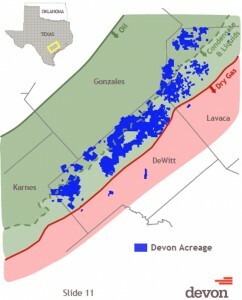 The deal includes 82,000 net Eagle Ford acres in DeWitt and Lavaca counties, with associated production of 53,000 boe/d. Current production is 56% oil, 20% NGLs, and 24% natural gas. The properties hold an estimated resource potential of 400 million boe. Devon has an average 50% interest in the properties and a 38% net revenue interest. There is at least one producing well in each owned unit in DeWitt County and Devon expects EURs as high as 800,000 boe. The company estimates a drilling inventory of 1,200 locations and has a joint development agreement with BHP Billiton. Devon expects annual growth of 25% from the assets for the next several years, with an ultimate peak of 140,000 boe/d. The deal will be funded with cash on hand and borrowings.